I first heard about Koi Cupid via a post by Sixten over at Hearts Content. It took a while, but I finally picked up a copy. Koi Cupid follows the trials of three cupids-in-training: Ren, the prissy one; Ai, the childish, playful one; and Koi the clumsy insecure one. Their mission is to find couples destined to be together, and help them find one another. Each cupid takes with her a special item which will help her achieve her goal. A couple brought together earns a cupid a stamp, and stamps collected may be spent on learning special abilities. Until a mission is completed (or, presumably, botched beyond repair), a cupid unable to leave Earth, giving the cupid incentive to work hard to complete her mission. On the antagonist side is Lizette, a mischievous demon. While the purpose of a cupid is to bring two people together, a demon’s work is to keep people apart. This places Lizette at odds with the cupids right from the start. 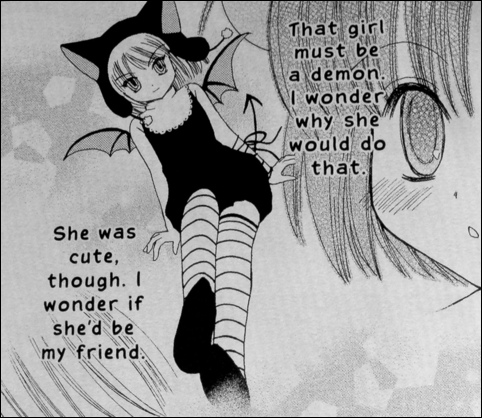 Ren’s holier-than-thou personality and Koi’s goal of one day becoming a demon-defeating guardian angel puts these two in a decent position to oppose Lizette’s bothersome ways, but Ai’s childish and naïve character sees a potential friend. Between opposition and attempts at friendship, this creates multiple manners of conflict between the young cupids and the young demon. Watching over the young cupids is Sister Yuuri, appearing as a two-tailed, winged cat, complete with eyebrows just bushy enough to give off a feel of wisdom. After all, every magical girl-style series needs a wise animal to guide the main characters from storyline to storyline. The stories in this first volume are wonderfully varied. Ai brings a couple together. 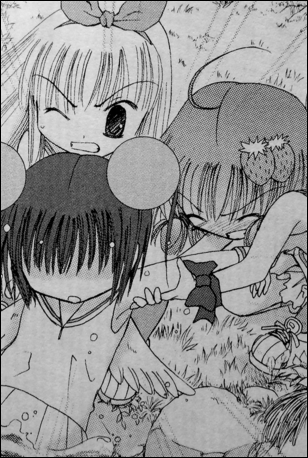 Koi faces her inability to use her bow, and confronts jealously over Ai’s ease-of-cupidery. Ai attempts to befriend a demon. The only thing missing is a story for Ren, which is to appear in the second volume. 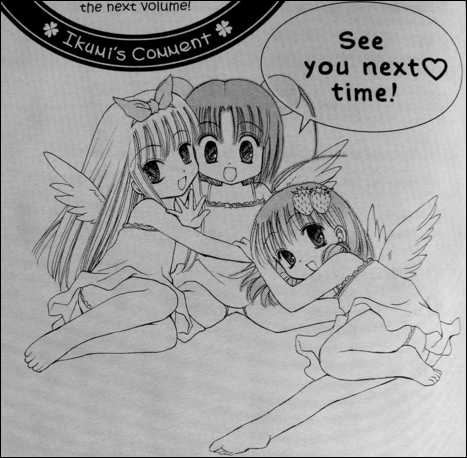 One of the original plans for Koi Cupid, as writer/artist Mia Ikumi writes in author notes, was for the story to end after two volumes. Because of this, the story for the characters advances too quickly. Keeping this in mind, the character development is well paced, but if it’s going to span more than four volumes, the pace will have to slow down in later stories. 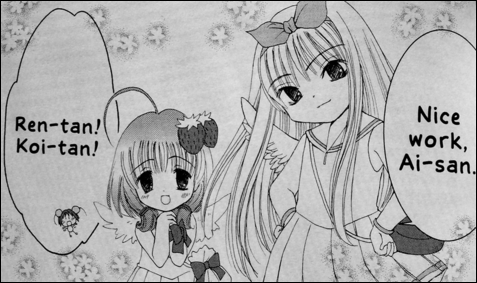 The character Ai makes me think of a more naïve Sugar (A Little Snow Fairy Sugar) with a dash of Kururu (Bottle Fairy). What makes her a precious character is how she always stays in her role. She never suddenly becomes wise beyond her years, or clever behind her ability. Her level of blind trust feels over-the-top at parts, but she remains consistent throughout. Between Ai having the first story in the book, and her interactions with Lizette, I get the impression Ai is essentially the “main character”, with Koi and Ren secondary to her. To this extent, Mia Ikumi gets extra points for giving Ai blue hair rather than pink or red. After seeing the aforementioned Sugar and Kururu, as well as Mao (Ground Defense Force! Mao-chan), it’s a welcome sight to see the red hair move to a secondary character, with blue hair taking its spot with the main character. Whereas Ai is given a couple of chapters to explore her nature and watch her in various situations, Koi doesn’t get nearly as much attention. Focusing her story on her inability as a bowman, there’s an opportunity to see her grow as a cupid, to improve, but the equal focus on her jealousy over how easily Ai is able to pair people together gives me the impression she didn’t get a fair introduction. Her story could easily have been moved to volume two or three, and volume one could have introduced her personality in a more likable manner, while still showing her lack of ability with her bow and arrows. As for Ren, she’s almost given less time than the minor characters, the guardian angel, Kou, and the supervising cupid, Rin. She’s shown to be conceited, but at the same time is presented with a hidden softer side, something which would have been better fit in a later volume. I’m thinking of something along the lines of Glenda in Petite Princess Yucie. Glenda is presented as a detestable character due to her personality, but later episodes show the reason for her personality (making her a more understood character), and then further episodes show the hidden side of her personality, which only begins to come out based on her interactions with her new-found friends. If Koi Cupid ever finds itself being adapted as an anime, this is one of the rare situations where I’d find myself in full support of adding in filler episodes (preferably with input from Mia Ikumi) to stretch out the growth of the characters. On the demon side, the story involving Ai and Lizette goes over-the-top for such an early story, but it sort of works. The combination of Ai nearly drowning and Ai fading away pushes too much into one story, and too much drama into the first volume. An anime adaptation would do best to split these events into separate episodes. For essentially a secondary character, Lizette is given a good role, with a decent amount of time and development. As noted, the low volume count expectation lead to developing characters more quickly than they should be. This takes me back to Glenda from Petite Princess Yucie. Glenda’s softer side doesn’t appear until she’s been through a lot of interactions with other characters in the series. Lizette is almost shown to have a compassionate side, and hopefully this will be pushed back a little, to give her more time to properly grow as a character in later volumes. The preview for volume two brings a concern for me. 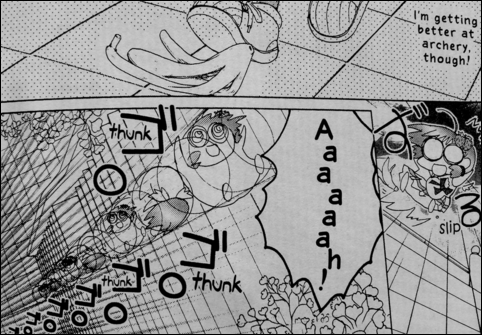 In one scene, Koi’s clumsiness is accentuated by her slipping on a banana peel. Unless there’s an unshown scene where someone happens to drop a banana peel on the ground in Heaven without anyone caring or noticing, I have to ask: where did the banana peel come from? It can’t be a prank from Lizette, unless Ai’s vanishing trick when taking Lizette back to the underworld doesn’t equally happen to Lizette near and in Heaven. Adding in a random prop in this way for the sake of a joke is a big mistake. The first and last impression you will have of Koi Cupid is CUTE CUTE CUTE AAAAGH IT’S SO FREAKING CUTE. I have to agree, there’s a lot of cute to be seen. There are also a lot of quick, stylized sketches of characters in various scenes which don’t quick make it anywhere near a level of “cute”. While not every image needs to be cute, some of the quick drawings of characters leave much to be desired. (Note that above image is not one of the ones I find lacking, but the banana peel image has good examples.) 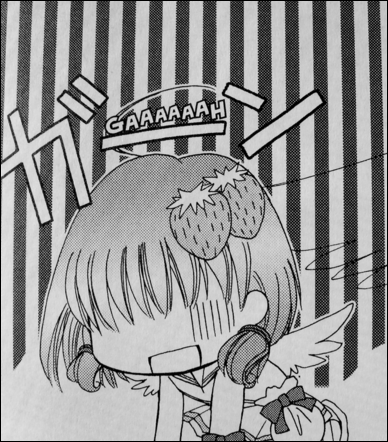 The artists of CLAMP showed in their Cardcaptor Sakura comic that quick drawings can still look good, and Mia Ikumi can certainly improve in this area. A big plus for Ai is her teethy grin. One of the things that stood out to me in the first episode of Janggeum’s Dream (although I didn’t write about it in my episode commentary) was Janggeum’s teethy grin after the strainer falls over her eyes. That’s also one thing I like about Sylvia in Ground Defense Force! Mao-chan, although her teethy grin lacks any detail, instead just being an open smile filled in with white color. A grin showing ones teeth seems to otherwise be fairly rare from what I’ve seen watching various series. So long as Ai and various other characters keep closing their eyes and showing their pearly whites as they smile, I’ll be reading. 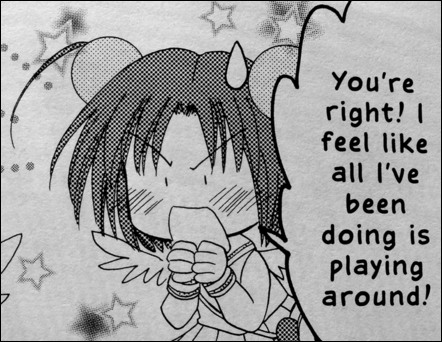 I never read Mia Ikumi’s well known work, Tokyo Mew Mew, so this is my first exposure to her work. (Being nine volumes counting its sequel, maybe I should look into it?) 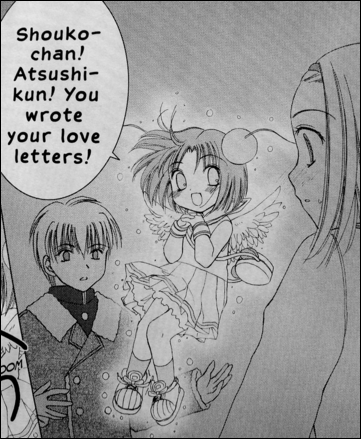 Because Tokyo Mew Mew had an anime adaptation, I have high hopes for the same for Koi Cupid. All Ikumi needs to do is ensure that instead of Studio Pierrot doing the project, it goes to J.C. Staff or Xebec, and everything should be fine and dandy.